After the winners, it’s the losers, or loser, turn. 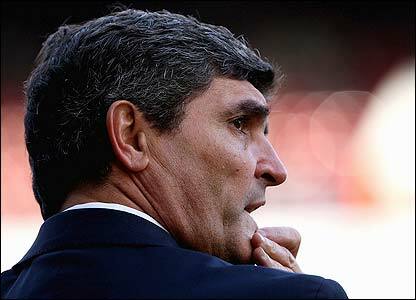 There quite a few failures this season across Europe but Juande Ramos has topped them all in my eyes. Not winning a game with Tottenham and after somehow getting Real Madrid as an Encore and managing the team to an amazing run in the middle of the season but eventually crashing and burning into unemployment. What a fall from grace for the Spaniard. Juande Ramos arrived in England after two straight UEFA cup trophies won with Sevilla and bringing the Spanish club to the Champions League for the first time. Tottenham were again after a horrible start to the league, finding themselves in the relegation zone early on. Tottenham, reportedly, wanted Ramos in the summer but Ramos decided to stay in Sevilla for another season and try to challenge Barca/Real for the title. 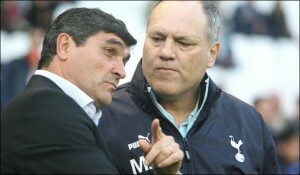 Martin Jol was sacked by Spurs in October, and the road for Ramos was cleared. He soon resigned his post in Spain and signed a huge 6 million Euro’s per season contract with Spurs. As things usually go with Tottenham, the manager who steps in after a horrible start gets things going, and Ramos’ magic touch worked again. The team immediately started winning, eventually finishing 11th in the Premiership. Ramos did manage to win a trophy, the League Cup. The triumph was sweeter as Tottenham beat their top two rivals on the way – Arsenal in the Semi Final, including a 5-1 victory in White Heart Lane in the second leg, Tottenham’s first win in the North London derby since 1999 and they beat Chelsea in the Final 2-1, Spurs’ first trophy since 1999 as well. The 2008-2009 campaign saw Ramos’ fortune take a turn for the worst, or just plummet and commit suicide. Tottenham failed to record a single league win in the first eight games and drew only two of them, the club’s worst ever start in the league. Ramos was fired on the 25th of October and about a month later somehow landed the dream job – Real Madrid Head coach, replacing Bernd Schuster. Ramos seemed to regain his luck, becoming head coach of one of the biggest clubs in the world after being fired from a mediocre Premiership club. Harry Redknapp replaced him as Tottenham’s manager, doing a great job, finishing 8th in the league after the abysmal Ramos start. He had to play Barcelona, in Barcelona, the Super Classico for his first game, losing 2-0. Then came an amazing leage run of 16 wins and one draw in 17 league games, bringing Real withing touching distance of first place Barcelona. But a humiliating 4-0 defeat in Anfield and an early exit from the Champions League courtesy of Liverpool started shaking the foundations under Ramos. They kept their for in the league but the 6-2 defeat to Barcelona in Madrid two months later was unacceptable and pretty much sealed his fate and finished off the teams championship hopes. Real went on to lose their last four league games, ending the season with five straight defeats. Ramos? He didn’t get his contract renewed, and today Manuel Pellegrini of Villareal was announced as Real’s new head coach. Despite the amazing run Real Madrid had with Ramos in the league, the season will be remembered as a disappointing one and all the credit Ramos gained during his time there was destroyed in the final month of the season. He’ll find a job very soon, I’m sure, but 2008-2009 wasn’t kind with him, Beginning and Ending. Jol has a job (Ajax). What about Ramos?